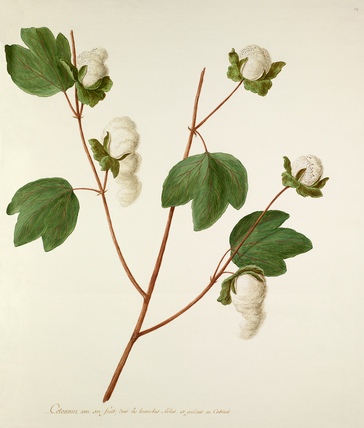 Watercolour of cotton by Pierre François Ledoulx, a painter of flowers and insects from Brussels. Taken from volume II of 'Regne Vegetal' which contain botanical drawings by at least four identified artists. Regne vegetal was compiled by Baron Joseph van Huerne and originally bound as a set of 4 albums. Two of these volumes are in the Lindley Library collections.